Editor's Note: There is an infographic associated with this release. A new survey commissioned by Visa Canada shows that 84 per cent of Canadians are being inundated with phishing scams, while less than half (48 per cent) report these scams to authorities. Of those who don't report, two thirds of respondents indicate they would if they knew how. In advance of Fraud Prevention Month in March, the cross country survey examined Canadians' responses to phishing, or attempts to trick consumers into revealing personal information like bank accounts, passwords, card numbers, and social insurance numbers. "We know that Canadians continue to receive phishing scams every hour of every day. Now we're seeing more sophisticated scams that target people through a variety of channels like email, home phone, and text," says Gord Jamieson, Head of Risk Services and North America Acquirer Risk Services, Visa Canada. "We need to arm Canadians with the knowledge and tools they need to recognize and fight phishing and to report it." The survey also revealed a full one third (31 per cent) had fallen victim to scams resulting in: malicious malware (23 per cent); disclosure of personal information (5 per cent); and loss of money (4 per cent). Messages urging recipients to 'act now' and 'verify user names and passwords' were most convincing, with 6 per cent acknowledging they had been convinced to click on fraudulent links. The survey also detailed some notable differences by age and region. 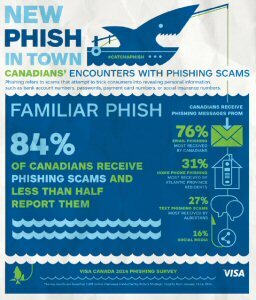 Young Canadians are most prone to phishing, with 92 per cent of those under 35 confirming they had been targeted. 38 per cent of seniors receive phishing messages by home phone. BC residents receive the most phishing messages at 89 per cent. Quebecers receive the fewest phishing messages at 77 per cent. They are also the most likely to inadvertently download malware at 31 per cent. 87 per cent of Ontarians combat phishing by deleting or simply not responding. Albertans receive the most text phishing scams at 27 per cent. 25 per cent of Prairie residents always report phishing scams, the highest among all of the provinces. While the majority of Canadians surveyed indicated they would report phishing attempts if they knew how, today most simply delete or ignore potentially fraudulent messages. Peter Cassidy, Secretary General of the APWG, a global coalition combatting cybercrime across industry, government and law enforcement, encourages Canadians to routinely report suspicious messages and/or notify the appropriate financial institutions. "It's almost instinctive to delete suspicious email; however, in addition to knowing how to avoid phishing scams, reporting a phishing scam is equally important and means you are helping other consumers from becoming victims," Cassidy says. Consider all unsolicited email, text messages, robocalls and postal mail requesting personal information to be suspicious. Fraudsters often create a sense of urgency or include exciting or upsetting information in the emails. Do not reply to any email that requests your personal or financial information. Remember, Visa does not contact cardholders to request their personal account information. Look for misspelled words and bad grammar - these are often indications of fraudulent emails. Always report phishing or 'spoofed' emails to the Canadian Anti-Fraud Centre (info@antifraudcentre.ca), APWG.org (reportingphishing@apwg.org) or the financial institution that it appears to be from. If you receive a phishing email that appears to come from Visa, forward it to phishing@visa.com. Be wary of hyperlinks and avoid clicking them. A single click can cause your computer to become infected and there may not always be visual clues of a compromise. A good rule of thumb when you're banking online: always look for the "lock" icon and an https:// connection to be sure you have a safe connection. To download a high resolution image of Visa Canada's infographic, please click here: http://visa.ca/catchaphish. Pollara Strategic Insights, on behalf of Visa Canada, conducted a survey with an online sample of 1007 Canadians, between January 13 and 16, 2014. The margin of error for a probability sample of this size is ± 3.1%, 19 times out of 20. Visa is a global payments technology company that connects consumers, businesses, financial institutions, and governments in more than 200 countries and territories to fast, secure and reliable electronic payments. We operate one of the world's most advanced processing networks - VisaNet - that is capable of handling more than 47,000 transaction messages a second, with fraud protection for consumers and assured payment for merchants. Visa is not a bank and does not issue cards, extend credit or set rates and fees for consumers. Visa's innovations, however, enable its financial institution customers to offer consumers more choices: pay now with debit, pay ahead of time with prepaid or pay later with credit products. For more information, visit corporate.visa.com and @VisaCANews.